Seasonal California cuisine at The Inn at Rancho Santa Fe. 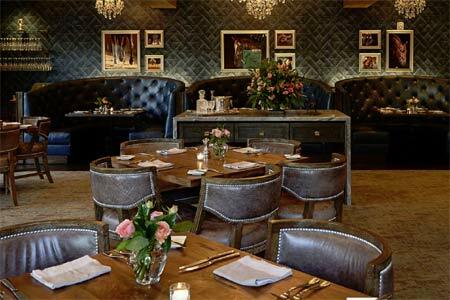 : A $12 million dollar renovation has resulted in a compelling dining experience at The Inn at Rancho Santa Fe. Morada ("house of many rooms") nods to The Inn's historic past, as Rancho Santa Fe's very first building, La Morada, circa the 1920s, remains intact as a part of its main structure. Executive chef Todd Allison fully expresses his talents and his California cuisine is a celebration of San Diego's local farms, fine meats and sustainable seafood, and Pacific fresh catch from Baja to Alaska. Menu highlights include pan-roasted baby octopus enlivened with roasted pepper jam, and Carlsbad mussels with charred Spanish chorizo. Natural beef tartare becomes the ideal bite with its medley of capers, onion, truffled garlic and pickled eggs. Herb-crusted Mary's fried chicken is a comforting affair, jazzed with morel and sage gravy. Allison’s tender honey-glazed Chilean sea bass mingles well with its grapefruit and bok choy companions, while carnivores will appreciate his takes on rib-eye, shorts ribs, lamb chops and more. End the evening with the rich dark chocolate pot de crème. Wines from a largely California-centric expansive list are astutely paired with the food. For those who enjoy effervescent libations, start the evening with the house signature --- the "Sparkling Santa Fe" with Hangar One, lavender-infused simple syrup, lemon and sparkling wine. A fireplace cozies up both the bar and dining room, while lunches may be enjoyed on the umbrella-dotted patio overlooking The Inn’s sprawling lawns and mature gardens.